Sixty-five years ago, hundreds of 2,300 years old scrolls were found in a cave by the Dead Sea. Many of the scrolls are Biblical texts. They also found a few pairs of tefillin in the cave. 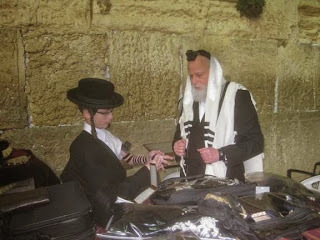 Jewish men have been putting on tefillin for thousands of years. How do we know how to put them on, or even to put them on? When we turn 13 years old our fathers show us how. Toras Emes: The Written and Oral Laws are the body and soul, both given by Moshe from H' to the Bnai Yisrael, at Har Sinai; the same Torah up until this day and forever!